Half of the joy in computing is figuring out complex problems, coming up with that solution that eludes everyone else, bonus points it is simple and elegant to boot. That’s all fine in theory when you are doing it for work or out of idle curiosity, however when it affects something you do often then it starts to drive you a little bit crazy. Enter stage left the problem I fought for about a week with my phone. The symptom was simple, I opened the Youtube app, started watching a video and about 3 to 5 seconds in it would pause. I could un-pause it and it would resume fine, but 3 seconds later it would stop again. My first thought was network issues. I ran a speed test on my phone. It showed about 50Mb/s so that wasn’t it. Maybe it was Youtube themselves. I know Google is huge, but even the best of them have issues from time to time. Nope, played fine on my desktop. I also wondered if my network/phone combination had screwed it over. Played on 4g just fine. I quick restart and no change. OK, at this point I considered this infuriating but it was time for sleep. The next day I concluded the issue had to be the Youtube app. According to the play store the app had updated a a day ago. I tried uninstalling the app, but I’m not allowed to do that (yey non root access). The best I could do was roll it back to the version that came installed on the phone (LG G6). I did that and no change. I also tried clearing the apps stored data, settings and cache. Again, no change. The following day I tried to show a colleague the issue at work. Ignoring that my phone seems to have major issues with the work wifi, the video played back fine. I didn’t find this even more frustrating or anything. That evening I was scrolling through Facebook and spotted a video I wanted to play. It to also played for a moment then stopped. Plot thickening. I continued to experiment with a few different sources of video over the next few days. Local video also had the same issue, as did videos on my local network. During this time I was googling most evenings trying to find anyone else with something vaguely like this. I discovered a battery saving mode on the Samsung’s can often affect video playback like this, however it was a feature/setting specific to their phones so that was out the window. Everyone else who had this issue was basically just working with a poor internet connection and hitting buffering issues. I ruled that out in several ways. I then went to show my colleague at work the local playback issue and it failed to happen and played back just fine. OK, at this point I actually felt like we were getting somewhere. I knew it had to be related to my house, not necessarily my network. That evening I tried disabling the wireless, no change, then I disabled bluetooth on my phone and like magic video playback worked as normal! Success! Well, sort of. 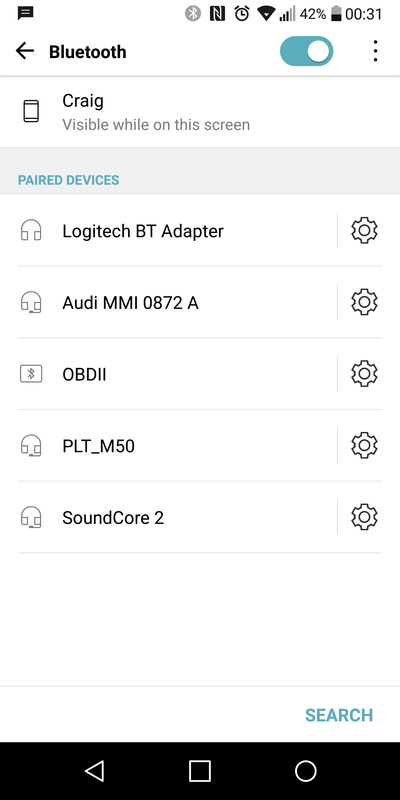 I actually use bluetooth day to day (connect to the car, headset, speakers etc). After a couple of days of running the phone without bluetooth on permanently I got fed up of that. The other day I sat down and started un-pairing connections to see if any made a difference. 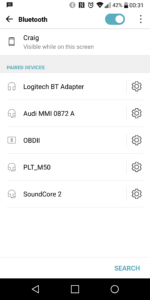 I eventually narrowed it down to the Logitech BT adapter I have connected to an amplifer to allow phones to connect the lounge audio system. If you note the top bar it shows bluetooth not connected, but the adapter is paired. That is not quite right. You see the bluetooth adapter in the lounge is on all the time. Once I paired my phone to it it was connected all the time and put all the audio through it. This was not what I wanted. To get round this I went into the settings for that device and un-ticked the media profile it had. 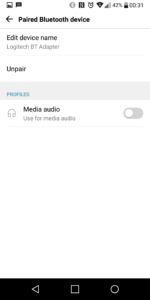 This would allow them to stayed paired and connected, while not causing my phone to use it for audio. Well, so I thought. Turns out my smart solution was a bit too smart for the phone. It still tried to play back through the adapter, but failed and in the meantime never showed it as connected, causing me to never realise this was the issue. If this was someone else’s phone it would not have been nearly as annoying. However, if it had not been so annoying, I probably wouldn’t have persisted enough to work it out.